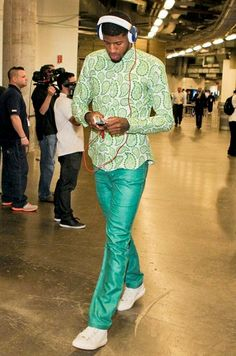 STACK's whimsical compilation of photos of the best- and worst-dressed players at the 2014 NBA Playoffs. The NBA Playoffs are winding toward a conclusion, but with guys like Dwyane Wade and LeBron James still around, the fashion statements keep flowing. Players know the cameras are on them as they walk from the team bus into the arena, and they take full advantage to flaunt their wardrobes. Inspired by the players' (sometimes outlandish) outfits, here's a look at the good, the bad and the ugly of 2014 NBA Playoff style. Welcome back, Russell Westbrook. Look, Chandler, I don't know what's going on here. Your shirt looks like it was taken from a stained glass window at whatever church the Hobbits attend in Lord of the Rings. Your jeans, or jeggings, or joggers, or whatever, are acid washed, which was totally dope in the 80s when you were wearing a diaper and had Spaghetti O's all over your face. And aren't your ankles cold? I know they are. Are you even wearing socks? I won't ask. Your fauxhawk is solid. I'll at least give you that. Honestly, Dwyane, you look like an old chalkboard in a one-room schoolhouse from the 1800s. How does one check the weather forecast in Miami and say, "You know what would be perfect to wear today? A wool sweater that slightly resembles a picnic blanket." Look at Wade's face in this picture. He's not even happy with his fashion choice. He's so mad. He's like, "Yeah, OK, I might have made a mistake, but my only other option was a kimono." Cheer up, Dwyane. At least you didn't pair it with these overalls, you weirdo. Picnic print is apparently all the rage in 2014. Russell, your pants are skinnier than Kate Moss, and your shoes are what I imagine it looks like when you stare at the sun too long and then try to refocus on what's in front of you. Get it together. Even when you wore this hideous get-up, you stuck to one color. Are you sure you're not colorblind? When was the last time you saw an optometrist? Are you crying out for help? How can it be, Tim, that you are over 7 feet tall and still wear clothes 10 sizes too big for you? Seriously, six Tony Parkers could fit in your shirt, and they could all live there and raise families and send their children to great schools. This shirt looks like something you picked out of the back of your dad's closet when all your button-downs were in the wash, but then you remembered your dad wears XXXL and it was too late to change. What is this, Tinker Taylor Hipster Soldier? The faux camo on LeBron's t-shirt and the glasses he definitely doesn't need, since he's bionic, are a weird combo, and the derby hat looks like it just jumped on his head without his knowledge, because there's no way he meant to wear that. But let's go back to the glasses. How do you take a person seriously who knowingly rocks specs without lenses? You can't, right? Paul George's struggles to dress like a normal human being have been well-documented over the years, but he stepped up his style game for the 2014 playoffs. A nice blue button-down with a stylish gray vest represent a pretty big step up over this paisley monstrosity from 2013. There's hope for you yet, Paul. KD, you may look melancholy in this photo, but at least your outfit is fresh. The shirt works, and the olive-colored backpack, your press conference staple, complements it well. As you grow older, your wardrobe matures, though sitting next to Russell Westbrook makes you constantly look like Brad Pitt. They don't call him Damian Trillard for nothing. (For you folks at home, "trill" is a word for somebody who's true and real.) The Portland Trail Blazers point guard kept it all business for his first playoff appearance, and one of his best pre-game looks was this light blue suit and cherry wood-like dress shoes. Bonus points for keeping it old school with the pocket square. Between throwing down dunks that make you scream in your living room and becoming the face of the Los Angeles Clippers, Blake Griffin also stunts on you while walking to the locker room. The shirt is a little loud, but the black blazer quiets it down. And the watch game is something serious. You go, Blake. We ragged on LeBron earlier for wearing a ridiculous hat, but some guys can pull it off better than others. Serge Ibaka is one of those guys who rocks the hat and makes you nod and say, "I get it." Plus his biceps are bigger than most of our heads, so we'd be wise to refrain from talking smack about the man's outfit.